I came to Western Washington University because I believed that I would be challenged and find a place that I could call home. I have always been a driven individual and wanted a university that would match my drive. Western has done that and more. I was accepted into Huxley College of the Environment and have found a place where I am constantly engaged and developing a passion for the natural world. Huxley has provided me with an opportunity to become an involved and successful student. This has also opened other doors for me, such as being qualified for the WWU Alumni Association Scholarship for Undergraduate Students. 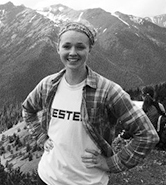 I plan to graduate in Spring 2016 with an Environmental Science-Marine Ecology degree and Anthropology minor because of the support system I have developed here and because of kind donors like the Western Alumni Association. I am a student-athlete at WWU and tend to have a lot on my plate at any given time. Not having to worry as much about working enough hours throughout the school year helps me out a great deal by giving me more time to focus on my studies and give my team 100 percent all of the time. I also have hopes to continue my education after I earn my undergraduate degree in Environmental Science and this scholarship allows me to save money to go towards that part of my life. One of the more important impacts on my life has been the opportunity to be a teammate for the last 16 years. Soccer is a large part of my life. Being on the WWU women's soccer team has been especially rewarding. I have created meaningful friendships with some of the best women I know through Western soccer and it has taught me a lot about working hard for yourself and others. As part of the WWU women's soccer team I really enjoy the time that I get to spend on and off the field with my teammates. They have made my journey at Western full of laughter. Other than that I enjoy climbing, hiking and feeding the stray cats in my neighborhood.